Despite RBI claims that the newly introduced bills are more secure, currency counterfeiters seem to have found a way around it and we should brace for more fake note discoveries, a SBI report said on Wednesday. "The promise of RBI that new currency notes of Rs 200 and Rs 500 (post demonetisation) are more secure and less prone to counterfeit is not entirely correct," SBI's house economists said in a report released after the RBI came out with its annual report. 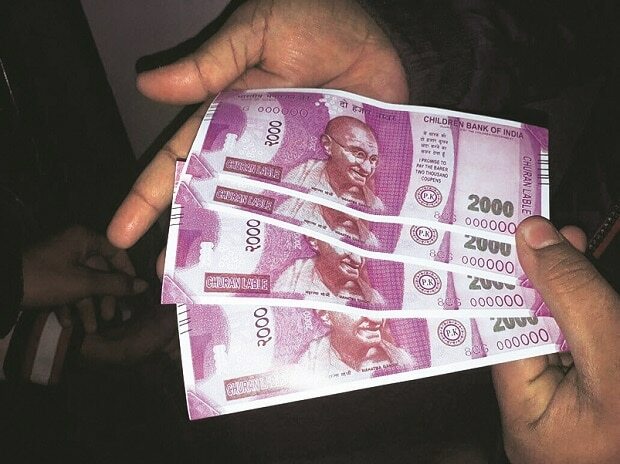 It said there was a "noticeable increase" in counterfeit notes detected in the denomination of new Rs 500 (up by 4,178 per cent) and Rs 2,000 (by 2,710 per cent), as per the data shared in the annual report. It added that given the trend, "it is expected that the number of counterfeit notes in the denomination of Rs 500 (new) and Rs 2,000 may increase further and RBI/banks/public should pay more attention to that". The annual report said almost all the 500 and 1,000 currency notes that were made illegal on November 8, 2016 have returned to the banking system, prompting the opposition to question efficacy of demonetisation in curbing black money. Banks received Rs 15.31 trillion, or 99.3 per cent, of the Rs 15.41 trillion worth Rs 500 and Rs 1,000 notes in circulation on November 8, 2016, when the note ban was announced, it said. This meant just Rs 107.20 billion of the junked currency did not return to the banking system as against initial estimates of about Rs 3 trillion, as they may have been stashed away illegally to avoid tax. The SBI report said that demonetisation and the introduction of the new notes has also aided a sharp decline in counterfeit notes by 31.4 per cent to 5.23 lakh pieces in fiscal year 2017-18. It also noted the positive impact on revenues because of the formalisation in the economy started due to the demonetisation and added that at least Rs 300 billion will come from the widened tax base. "If we assume a trend 30 per cent growth over FY18 numbers then at least around 2 crore new tax payers will file their return in current fiscal. Assuming that 75 per cent of such have filed with zero income and only 25 per cent paying a minimal Rs 5,000 tax per month then Government will earn extra tax revenue of around Rs 300 billion over and above the trend estimates," it said. It added that this is the minimum revenue the government will garner as most of the newly added taxpayers in the system are from the higher tax brackets. The SBI economists also welcomed the shift in RBI communication strategies, noting that there is more focus on rigorous research now from the earlier strategy of public speeches. Speeches by RBI's top management more than halved to 22 in 2017 and stand at only 10 for this year, it said, adding that there have been 12 'Mint Street Memos' (research papers on contemporary topics) since its launch last August.